BRIGHTON, Mich. - A 102 year old man has been named the honorary president of Ford Trucks - but this isn't just any man. 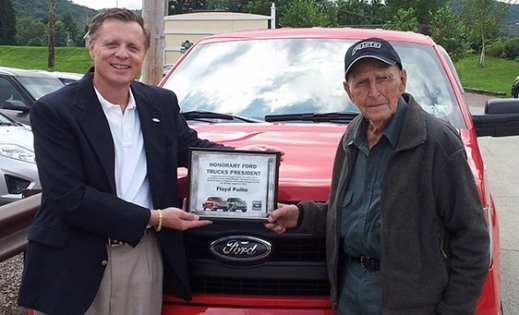 Floyd Pullin had just purchased his 16th Ford vehicle, a 2013 F-150, when he was honored with the title. Having purchased 16 Ford vehicles in his lifetime, Pullin has witnessed the evolution of the Ford vehicle over the course of 87 years! In 1926, Pullin purchased the Model T from Ford Motor Company when it was still being run by Henry Ford himself. After owning the Model T, he loved the vehicle so much that he made Ford his brand of choice. To thank Pullin for almost 9 decades of loyalty, Ford Motor Co. made Floyd the honorary president of Ford Trucks for a day - on his birthday! A special party was also held for him in his home state, complete with cake, a limo ride (something he had dreamed of riding in his whole life) and a video made especially for him by the Ford Trucks team (which you can watch below). Ford Trucks are Built Ford Tough - and so is 102 year old Floyd who was named honorary president of Ford Trucks! Floyd knows that Ford Trucks are reliable, resilient and attractive trucks to own. Much like Ford did with Floyd, we will be happy to show you why Ford is the brand to own. So stop by our Novi Area Ford Dealer today! We have a large selection of New Ford Trucks, as well as New Ford Cars, meaning you're sure to find something you'll love for years to come. So come on down and let us show you why it's always better with Ford.